A long time ago I read the Michael Dobbs book House of Cards so I was intrigued when Netflix produced their own version set in the White House. 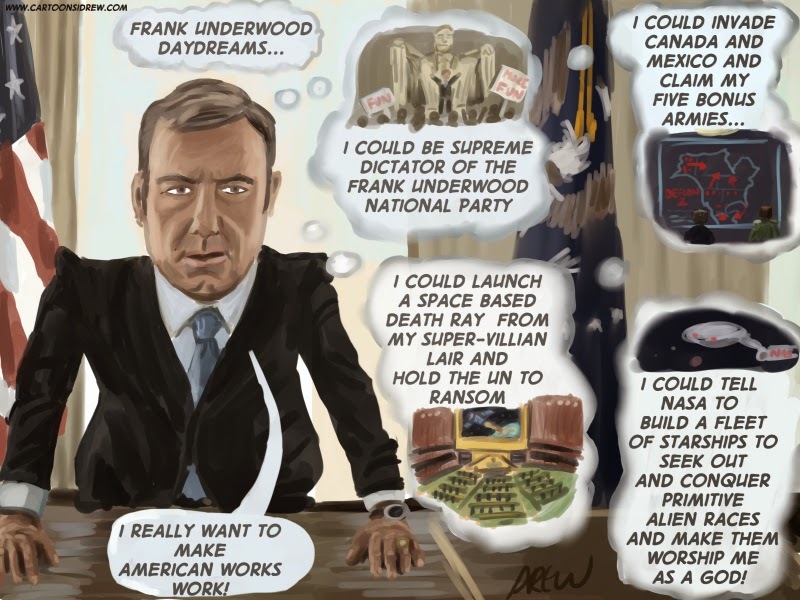 Its a sort of dark anti-West Wing now in season 3 and (I can't go further without revealing mild spoilers) Kevin Spacey's Frank Underwood is POTUS having schemed and killed his way to the top. Now with all this power and influence all Frank wants to do is launch a New Deal style jobs program called America Works or Amworks. Come on Frank you can be much more EVIL than that. So here are my cartoony imagining of what he really wants to do if he would only give in to his super villian side.